I have an exciting announcement today. After months of shutting down my shop due to all sorts of circumstances, I am excited to be opening up shop again! But this time around there are a couple of exciting changes! I will be offering custom orders! Remember this post? Well you can order a custom puff quilt AND bedding in any combination of these fabrics. And if you have a specific fabric in mind–I can work with you on that! Custom orders can be made through direct email to me (honeybearlane@gmail.com) or through the Honeybear Lane Etsy shop (via Etsy convo.) Prices are listed in the Etsy shop listings. This was available through a limited number of quilts last year, but now I am taking on team members, I have the capacity to create your favorite designs available for immediate shipping. However we won’t be officially listing any quilts until September but you can pre-order your favorite quilt now for reservation. 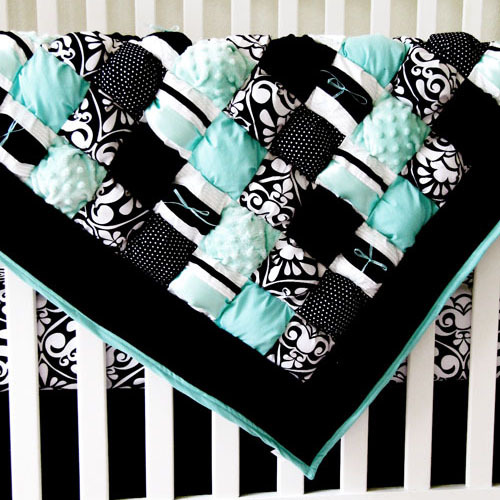 The popular “Diamonds” quilt is definitely going to be one of them! Pre-orders can be made directly through email (honeybearlane@gmail.com) If you’d like coordinating bedding items, they can be custom made. I’m so excited about the direction I’m taking with my shop. And I can’t do it without you, my faithful readers and customers! This quit is so beautiful! I love it so much!! I can’t wait to give it to my daughter for her first Christmas! I really truly strive to turn out the best quality products that I can. And I can assure you that now that my business is growing, I will still oversee the quality control of each item that is sewn and shipped. If you ever have a problem with any of my products, just email me and I will work with you to resolve the problem.